There are smartphones and then there are smartphones with great low-light photography skills. This list is about the latter. Low-light photography is particularly challenging for any camera, and more so for smartphone cameras. Due to the restricted space, smartphones house smaller sensors, smaller lenses, smaller everything. Yet, where other cameras mostly just leverage the hardware, smartphones are now blessed with superpowers like artificial intelligence and machine-learning. Some even deploy more than one lenses while one of them tries to variate the aperture to take good low-light shots. 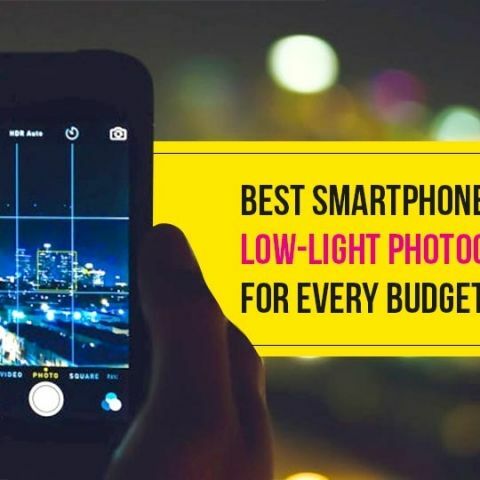 To make it easier for you, we have compiled a list of smartphones that have great low-light capabilities at every budget. It’s optimistic to expect a phone under Rs 10,000 to take good, legible photos under low light, but if ever there was one, it is the Xiaomi Redmi 6A. Xiaomi’s budget offering sports a 13-megapixel primary camera at the back with f/2.2 aperture and 1.25um pixel pitch, which converts to some decently composed low-light shots. Xiaomi’s noise reduction algorithm also works to make the photos appear smoother, but then again, don’t expect high quality low-light photos. The current leader in the mid-range segment, the Redmi Note 5 Pro has been acclaimed to have a kickass camera that performs good not only in the day, but also pushes the boundaries of low-light photography in the mid-range market. The phone rocks a dual 12-megapixel sensors at the back which are quite capable of aesthetically pleasing shots at any time of the day. While the daylight photos come out sharp and vibrant, the low-light shots aren’t that far behind. As we noted in our review, the dynamic range when shooting under poor lighting with good colour and detail retention, but definitely not as well as say, the Google Pixel 2 XL. Go a little higher and Nokia’s latest 7 Plus comes into mind. We tested the phone out at low-light situations and it is surprisingly well tuned to shoot inside dingy pubs and restaurants, even if the lighting is poor. It sports dual 12-megapixel cameras at the back with the primary sensor having a wide f/1.75 aperture and 1.4um large pixel pitch. An early version of the software caused some shutter lag, but with the new Android 8.1 update, the phone can sometimes give more expensive flagships a run for their money. In its flagship Zenfone 5z, Asus relies on the combination of superior and Snapdragon 845's AI Engine to make low-light photos better. The hardware on the back is a 12+8MP sensor with a relatively large 1/2.55 and 1.4um pixel pitch. There's four-axis OIS on both the lenses. The photos taken by the smartphone is post-processed using machine learning algorithms to remove noise, enhance details and improve clarity. The resulting shots are quite impressive, if you compare against what smartphones from last year could do in that price. OnePlus has made a name for itself for providing cutting edge hardware at affordable prices. With the OnePlus 6, the company offers a dedicated sensor just for low-light photography. The secondary 20MP sensor with a 1/2.6" sensor size and 1.22um pixel pitch, activates only when the surrounding lighting is under 10 lux. There's four-axis OIS in both the lenses and the photos are visibly clearer from last year's OnePlus 5T. The LG G7+ ThinQ is an underrrated smartphone and perhaps has gotten lost in the din made by the likes of the OnePlus 6 and the Poco F1. The smartphone makes full use of Snapdragon 845's AI Engine to enforce neural nets to enhance the colours, details and the clarity. The same extends to low-light photos. It uses a 16MP f/1.6 lens with a large 1/3.1" sensor with 1.0um micropixels and OIS. It’s an iPhone. Of course it’s going to take good photos. But since the iPhone 7, Apple has been working really hard to improve the low-light imaging prowess in the iPhones. So much so, that despite having a single camera at the back, it is more proficient in low-light photos than most flagship Android phones. Apple made the aperture wider to f/1.8 and fitted a new 12-megapixel sensor (as compared to the iPhone 6), along with OIS. Also, Apple has used a new camera algorithm that makes images look perhaps the best in its current price range. What others do with dual cameras, Google managed to do with a single sensor. And that too, better than anybody. Google flexed its AI muscles big time in the camera of the Google Pixel 2 and it shows. More importantly, Google has maintained the same camera features in both the Pixel 2 and the Pixel 2 XL, making the choice easier for people. Even if you are paying less for the Pixel 2, you’re not losing out on the superior camera quality. The magic is in Google’s HDR+ mode that will revamp the photo you just took, right in front of you. The resulting is quality is by far the best we have seen in smartphones, especially in low-light. Combine that with unlimited photo storage on the cloud, and you have a no-brainer here. The Samsung Galaxy Note 8 was the first to introduce dual cameras to the flagship lineup and even with the Galaxy Note 9 now out in the market, it's still just as good. It uses a wide-angle and telephoto lens combo and for low-light, it has a shallow f/1.7 aperture and 1/2.55" sensor with 1.4um pixel pitch and four-axis OIS. Needless to say, the results are more than satisfactory, only if you like Samsung's aggressive smoothening algorithms. The current reigning champ in terms of smartphone camera, the newly launched Huawei P20 Pro sports not one, not two, but three cameras. The cameras have been designed by Leica and as we noted in our review, “The Huawei P20 Pro shames every other smartphone camera in the market right now, thanks to the Leica branded optics paired with adequately sized imaging sensors.” This should pretty much sum up our observations about the phone. Essentially, this is the best smartphone camera, for all situations. Period. Samsung’s flagship Note for 2018 has been all about the S-Pen, but it also reinforces on the variable aperture dual camera seen on the Galaxy S9 Plus. The ‘camera reimagined’ is what Samsung called it. It’s quite innovative, but isn’t much of a reimagination. What Samsung did, however, is manage to engineer a twin aperture technology in the tiny camera module. Two apertures — one at f/1.5 and one at f/2.4 which gives the camera the freedom to switch between a low-light mode and a normal light mode. No points for guessing which is for what. Nevertheless, at f/1.5 aperture, the camera at the back of the Galaxy S9+ can absorb more light and as a result, provide very well-lit photos topped with Samsung’s aggressive noise reduction. The iPhone 8 Plus builds upon the dual cameras introduced in the iPhone 7 Plus and improves it by a lot. The dual cameras can take some impressive low light shots as well as shoot in portrait mode, with portrait lighting that renders the images with a professional tinge. Apple’s algorithms also ensure you get some of the most natural-looking photographs under any circumstances.